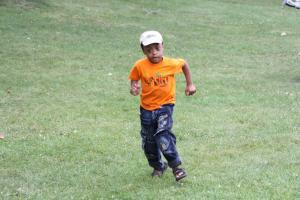 Going to summer camp is one of the definitive experiences for Canadian children. But when Dorothy Peddie and Ingrid Anderson, two working moms from the Greater Toronto Area, discovered there was an additional fee to send their sons with Down syndrome to summer camp, their thoughts turned to families who could not afford this opportunity for their children. “It’s such a hardship having to pay extra and [especially] seeing that the children who are most vulnerable and who would benefit the most end up not partaking in what is, some might say, a Canadian right of passage for going to summer camp,” Anderson told Samaritanmag. Last year, Peddie and Anderson organized a golf tournament fundraiser to assist Brampton-area families that were struggling to come up with the extra fees to send their child (or children) with special needs to camp. On top of the regular camp fee, parents must also pay more than $2,600 to send a one-on-one worker to accompany the child for eight weeks. While this assistant is vital for many children, it is a hefty price to pay each summer. The tournament, entitled Level Playing, raised more than $15,000 and assisted 13 families last year, and will return to the Caledon Country Club on June 10 with the hopes of raising more. 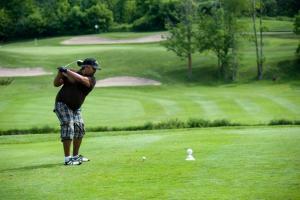 $145 includes continental breakfast, 18 holes of golf, gift bag, gourmet lunch and other goodies. Non-golfers can attend the lunch and auction for $55. Peddie and Anderson were friends long before their sons were born. Peddle gave birth to Nathan nine years ago, and Myles was born two years afterward—both were diagnosed with Down syndrome and this commonality strengthened the bond between the mothers. Down syndrome occurs when a child receives an extra chromosome (usually chromosome 21) from their mother or father during conception. Due to the extra genetic material, the syndrome can affect a way a child develops as well as his or her physical features. Approximately one in 800 Canadian children is born with Down syndrome, according to kidshealth.org. 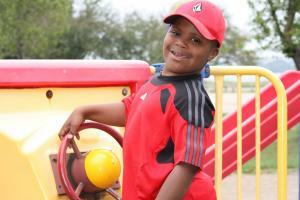 Peddie’s nine-year-old son, Nathan, was diagnosed with Down syndrome at birth. Despite this, he is staying active and learning in an integrated setting in the public school system, as is Anderson’s son, Myles. “We’re doing our best to have [Nathan] integrated into society as much as possible because the objective on the long-term basis is for him to be able to contribute back,” Peddie says. In addition to these costs, it is more common for families that have one child with autistic-spectrum disorder (ASD) to have a second child with the same developmental challenges—ensuring that sending two kids with ASD to camp is unattainable for many families. The mothers do approve of having a one-on-one worker responsible for helping out certain children with duties such as eating, dressing, going to the bathroom, as well as having an added pair of eyes to supervise; however, not all children with special needs require an extra hand around and this can even hinder the youth’s social and developmental skills.